Go to Home Depot and buy a plastic "For Sale" sign. They work great for internal strips. Yeah, E6000 takes a long time to dry. Let it! Your "test fit" pictures were only 3 hours ago, so I know you didn't give it near enough time. Also, for the shins especially, I would HIGHLY HIGHLY recommend putting in an inside strip on the front. There will be a lot of flexing there, and you want it to be as strong as possible. Then don't try it on for at least a full day. (: Oh, and from the pictures, it doesn't look like you used enough glue either. Slather it on there. You can peel up anything that oozes out. #2 pencil, candy cane... whatever you have handy. Looking good! Hey Mike, great job on the painting and trimming! I figured out why your grey doesn't look so clean. Humbrol paints NEED to be shaken, and then stirred to get the pigment mixed in with the base really well. Shake the little jar for a minute, then open it and stir it up some more with a toothpick before dipping your brush. You'll be amazed at how much better the paint goes onto the plastic. As far as the vocoder, you should be using the semigloss black (or satin black)... That looks really shiny, are you sure you're in the right jar? (: Positioning of the mic tips looks great! I met Mike tonight and we had an impromptu armor party. We got his arm pieces all trimmed down and ready to glue... I gave him some tips about trimming and using Lexan scissors... at the end of the night, I wanted to show him the light at the end of the tunnel, so we made him into a blue tape trim trooper! Two years later (almost exactly!!) and I found and purchased a beautiful TK saber. It's from Arm on Fire Custom Sabers on Facebook, there was about a 4 month wait (he got an order for 6 sabers at once, which took a lot of time, of course). Here's the video the maker made, showing it off... This also serves as a POC for anyone who wants to buy their own. https://www.facebook.com/ArmOnFireCustomSabers/videos/1436817806401941 I built a quick and dirty belt attachment for the Covertech clip that fit the 1.5 inch belt clip part, as well as kept it centered on the plastic plate by way of a couple cap rivets around the belt clip portion. It's attached to my belt through the top two chicago screws that normally hold on my holster. The bottom two screws are just hanging out. It works a lot better than a pool noodle! Turning a toy into armor! 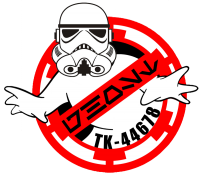 TK-42176 did just that! There were a ton of modifications needed for it, though. But man, it looks good! Mine are done like #2. Kredal replied to Daetrin's topic in Getting Started - Read this First! The last time I emailed Troopergear, it took about 6 days for a response. Patience is the watchword in the world of building armor! Welcome to the club! Take lots of pictures, post lots of questions, tons of people here to help you out. A year later... and I did something I never thought I would. I let someone else troop in my armor. To be fair, he did let me troop in his too. I think it was a fair trade.